Explore fluid dynamics with this easy hands-on experiment. 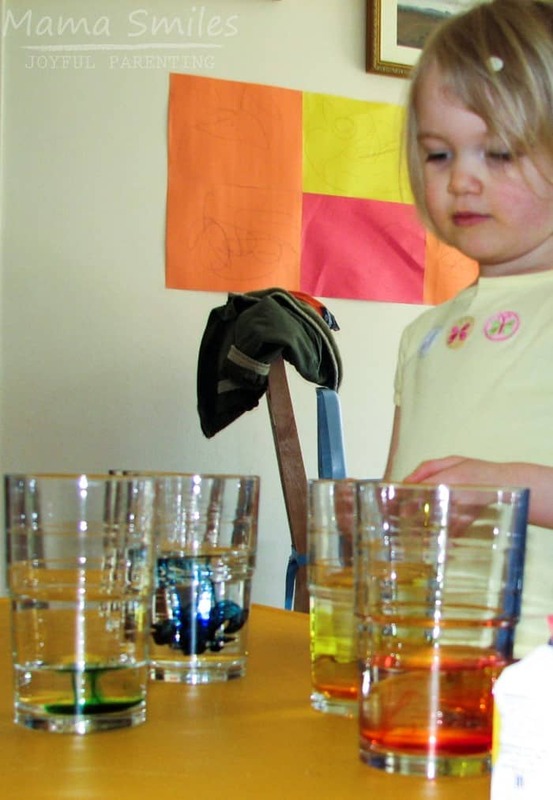 All you need for this simple physics for kids activity is glasses, water, and food coloring. The perfect preschool STEAM learning activity! This week’s Virtual Book Club for Kids theme is rainbows, and I thought it would be fun to bring back a post from when I was a brand new blogger. 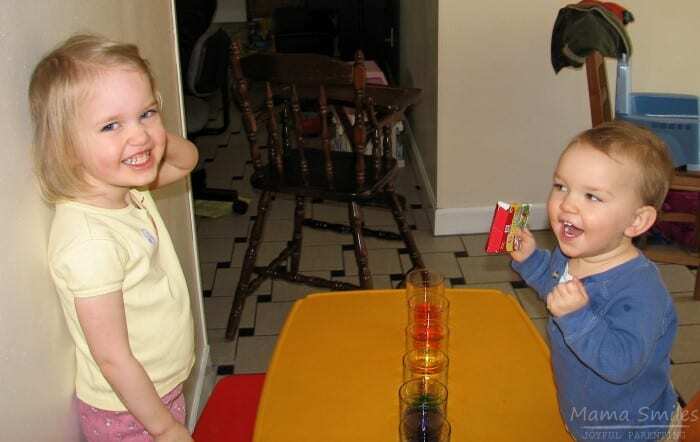 Emma and Johnny are now 11 and 9 years old – here they are 1 and 3 years old. This simple experiment combines color knowledge with a little bit of very simple physics for kids. This week’s featured book is A Rainbow of My Own by Don Freeman. The Rainbow Book by Kate Ohrt is a great emotional intelligence themed alternate read for this theme. Food coloring and water is a great way to introduce children to some basic concepts of fluid mechanics. We got out six glasses, which we filled with water. 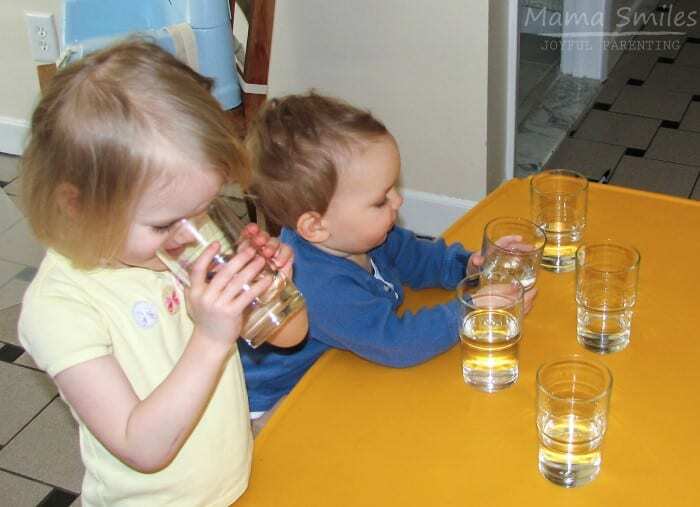 First, the kids tasted the water in each glass to see if it tasted the same. I’m not sure what they concluded, since they definitely drank more water from some glasses than others. I wanted to do the water and musical notes trick, but our thick IKEA glasses didn’t sound very musical. Crystal glasses work beautifully, if you have them. Next, we put some food coloring in each glass. We did a little color mixing (red and yellow to make orange, and blue and red to make purple). We talked about fluid density (the food coloring is denser and therefore sinks to the bottom) and fluid dispersion (looking at how the food coloring spread through the water). If you’re wondering, the thing in Emma’s hair is a sticker. Then we stirred the food coloring in completely and arranged the glasses in rainbow color order. This would have been a good place to illustrate wavelength differences in color by filling glasses with corresponding amounts of water. If I had done this, the red glass would have had the most water, since red light has the longest wavelength. There liquid in each glass would decrease, until finally the purple glass would have the least since it has the shortest wavelength. But, we didn’t do this. Maybe next time. I don’t think it would have worked this time, anyhow, because Johnny was comparison tasting the different colors of water. We ended the activity by pouring all of the glasses of water into a white bucket to see what color we got when they were all mixed together (brown). Most importantly, everyone had fun! While the kids were a bit young to understand all of the concepts I introduced, activities like this play a large role in getting children interested in science. This week’s featured book is A Rainbow of My Own by Don Freeman. The Rainbow Book by Kate Ohrt is a great emotional intelligence themed alternate read for this theme. Either book pairs beautifully with all of these activities! Check out this collection of STEM activities for kids using household items for more simple science learning activities. 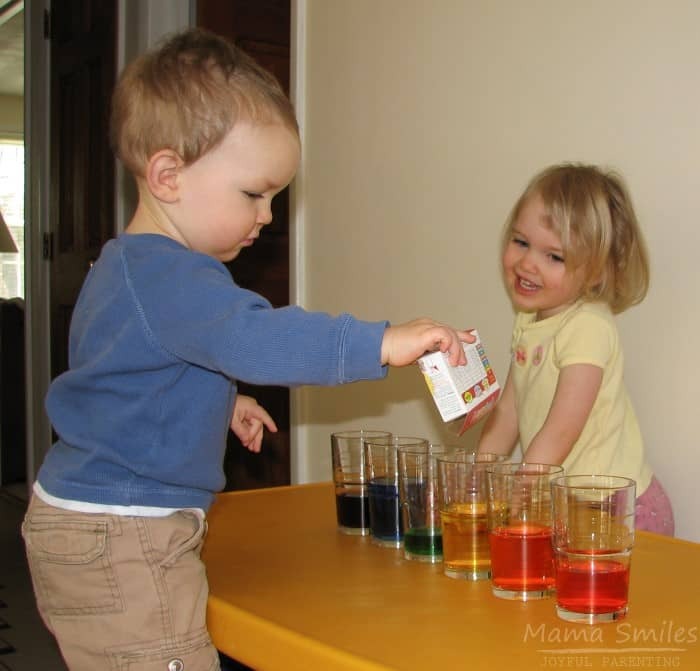 Do you have a physics for kids activity that we should try? How about a rainbow themed picture book we should read, or a rainbow themed activity? Please share any ideas you have on my Facebook page, or tag me on Instagram. Cute! I’ve been meaning to do something like this with Emily for awhile now… thanks for the reminder! 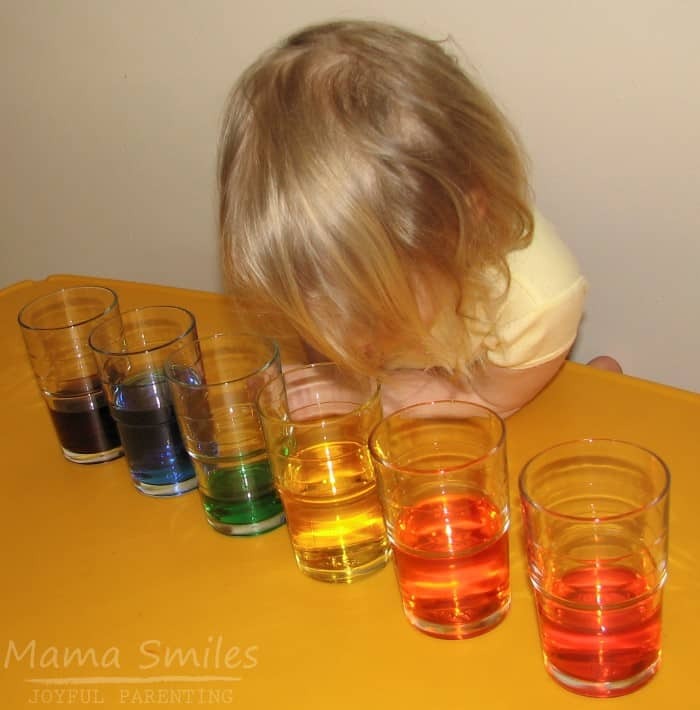 I love how you can sneak in so many different science lessons in a simple color mixing activitiy… fabulous! Great activity. We’ll have to try that. We love anything that has to do with color mixing. This looks like a simple but fun activity. Another one that we shall try too :) The glasses look very pretty lined up with the different colours! This looks like a great idea that I can do with my little ones. Thanks! I vote food coloring as essential a craft supply as paper and crayons and glue! This will be a fun one to try with my kids outdoors when the weather gets warm enough. Then it won’t matter if they stain the grass. I am loving all the Science suddenly appearing on my favorite blogs- thank you! Great activity! We’ve done a version of this using bowls, but I really like the fluid dispersion in the glass. I never thought about that before. We will definitely be doing this one! Abby and I did this this morning – she had a great time! Thanks for hte fun idea! Congrats on your new site! This looks like a fun activity. My son loves these kinds of kitchen experiments! Oh my goodness, look at how little they are! And the constantly trying the different cups of water reminds me of the movie Signs.